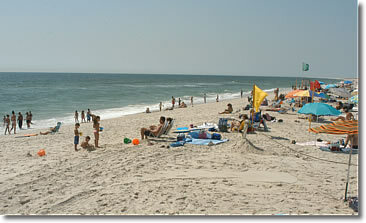 Jones Beach State Park is a world-class swimming destination. The park offers surf bathing along its 6.5 miles of ocean beach, one-half mile of bay beach for stillwater bathing, and two swimming pools. The west end of the park provides wonderful surf fishing, a boat basin and undeveloped areas that are home to a variety of migratory birds and native plants. The park is also home to the Theodore Roosevelt Nature Center, which includes environmental displays about the seashore, educational tours and programming for all ages. Jones Beach has a two mile boardwalk and a "Castles in the Sand" photo collection at the East Bathhouse which depicts the development of the Long Island State Park and parkway systems. Additional attractions include deck games and miniature golf. Jones Beach also hosts the popular Bethpage Federal Credit Union Annual Memorial Day Weekend Air Show.